KIEV, Ukraine -- Russia's hybrid military forces attacked Ukrainian army positions in Donbas 29 times in the past 24 hours, according to the press service of the Anti-Terrorist Operation (ATO) Headquarters. 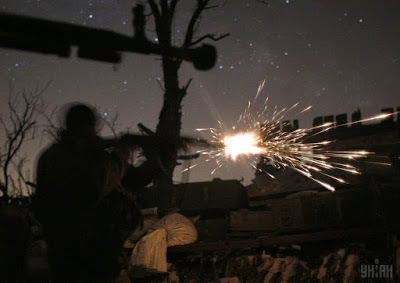 "In Mariupol, the invaders fired 120mm and 82mm mortar, grenade launchers of various systems and heavy machine guns on the defenders of the town of Maryinka. Enemy snipers were also active there. Ukrainian Marines near the village of Vodiane came under fire from anti-tank grenade launchers and heavy machine guns, and from small arms and infantry fighting vehicles near the village of Shyrokyne. The militants also fired grenade launchers on the Ukrainian positions near the village of Pavlopil, while the defenders of the villages of Hnutove and Chermalyk came under fire from heavy machine guns," the press service wrote on Facebook. In the Donetsk sector, the Russian occupation forces used grenade launchers of various systems and heavy machine guns against the Ukrainian army near the town of Avdiyivka and the village of Pisky. The enemy fired grenade launchers on Ukrainian fortified positions near the village of Luhanske. The defenders of the village of Opytne were attacked with heavy machine guns, while the invaders fired small arms on Ukrainian positions new the village of Kamianka. Moreover, enemy snipers were active near the village of Troyitske. In the Luhansk area, the Russian-backed militants opened fire from automatic grenade launchers on the defenders of the village of Lobacheve. In addition, they used small arms against the defenders of the village of Novo-Oleksandrivka. Despite armed provocations, the Ukrainian army strictly observed the ceasefire and did not fire back," the press service said.